Hello again, i thought I might make some further updates to my blog and what has been happening recently. A few months ago I decided that I wanted to replace my Cisco ASA5505 with something newer that offered gigabit ports and somewhat stronger firewall etc. At work we have removed Cisco from the firewall infrastructure and replaced it with Checkpoints, so I thought checkpoint is the way to go. The device I purchased was Check Point 680 + Wi-Fi + ADSL + 3 Yr [CPAP-SG680-NGTP-WDSLA-W-3Y-BUN] with a 3 year support agreement. It costed me about $1515 AUD, and upon talking to the Checkpoint reseller this device would be able to handle 100mbit link as I was going to be upgrading to a 100/40 NBN Fiber Service in Australia, and probably having dual 100/40 links terminating into this device. Upon opening everything and getting it up and running, it was a breeze and simple and looked very impressive. Upon starting to download my first 5GB speedtest file from a HTTP server, and all the blade modules turned on, with AV, IPS, Firewall, Spam etc, the device severely underperformed and I was only able to achieve 30-40mbit. When checking the CPU on the device it was reaching 100% and everything was so unresponsive. I then turned off all the blades except the firewall and it only managed around 60mbit which again is very poor. The specification sheet shows clearly this device can handle 1.5Gigabits of throughput traffic when firewalled, try about 60mbit instead, quite pathetic from Checkpoint. Even when doing the large file transfer, pinging the checkpoint device itself inside the LAN was slow and unresponsive with pings 500+ ms which was crazy. I complained to the reseller this device is not worth the price I paid for as the speed is awful, and they got me intouch with a local checkpoint engineer. The engineer advised to upgrade the software on the device with a later one, so I did but still performance was bad and certainly nowhere near impressive to a Cisco ASA. He advised to consult with checkpoint directly and see what they can do. 2:22 PM Checkpoint : Can you pass the FTP file now? 2:24 PM Checkpoint : What happens when you ping through the appliance, and not directly to it? 2:29 PM Checkpoint : What is the device firmware version ? 2:34 PM Checkpoint : Want to try it ? 2:37 PM Checkpoint : Would you like to test it ? 2:38 PM Customer: what does the R&D think about this ? 2:42 PM Customer: so what handles 100mb with all the features on? So there as you see above, proof a Checkpoint 680 cannot handle high speed WAN links, so do not buy one! Luckily I was able to return it and get a refund, as the price for it $1500+ is certainly not worth it. I have a 600 also. It is terrible. If I log into the appliance to add a rule it stops responding and I need to log in again. If I click the log tab to view logs it loses connection and I need to log in again. If I call support, they want to sell me support before they will talk to me. This is clearly a product problem. I should not need to purchase support for a product which does not deliver on Checkpoints advertising/marketing. Hi Steve, I know your frustration. This product is nowhere near worth the money, it is really bad, and I cant believe they released such a product with under-performing hardware. 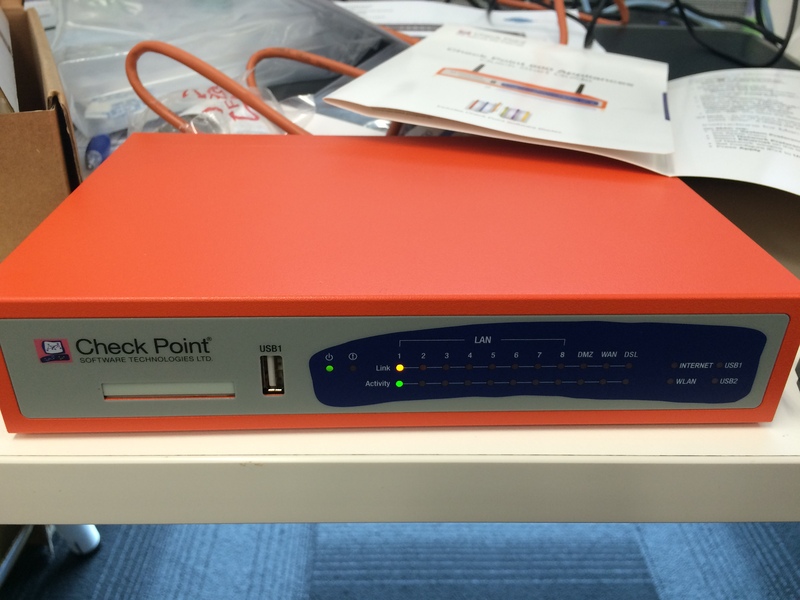 Ive used always Cisco based firewalls and I thought to give checkpoint a try, I was quite disappointed. This is why I went back to Cisco and got a 5506-X, and works flawlessly. Same issues for me. I am swapping out two of them today for new sonicwall TZ500 devices.